The Great Wall of China is a series of fortifications made of stone, brick, tamped earth, wood, and other materials, generally built along an east-to-west line across the historical northern borders of China in part to protect the Chinese Empire or its prototypical states against intrusions by various nomadic groups or military incursions by various warlike peoples or forces. 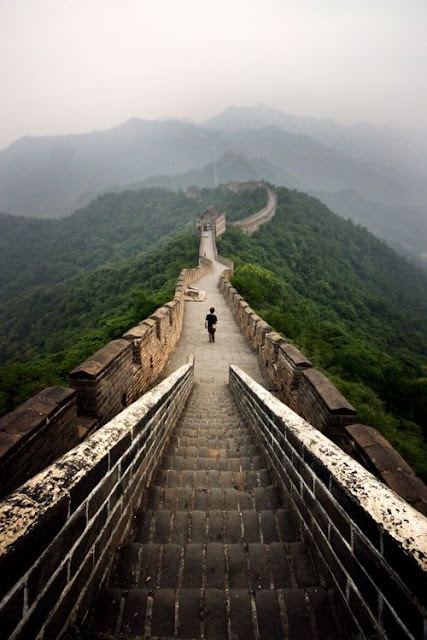 Several walls were being built as early as the 7th century BC.these, later joined together and made bigger, stronger, and unified are now collectively referred to as the Great Wall.Especially famous is the wall built between 220–206 BC by the first Emperor of China, Qin Shi Huang. Little of that wall remains. Since then, the Great Wall has on and off been rebuilt, maintained, and enhanced; the majority of the existing wall was reconstructed during the Ming Dynasty.